As New Socialist Alternative wrote in its pre-strike statement:“Since the arrival of the disastrous policies of neo-liberalism in 1991, the working class of India have embarked upon a General Strike 17 times”. Here again this was a strike at the disastrous policies of the Bharatiya Janata Party (BJP) – led, National Democratic Alliance (NDA) government, which has failed the working people in all spheres. Under Modi’s regime, the neo-liberal offensive is going at a breakneck speed. India’s 1 per centers – its super-rich – have been getting richer even faster. India’s top 1% holds close to half of the country’s total wealth. Although named “emerging markets”, 21st-century capitalism is brutally impoverishing the peoples of the underdeveloped economies. Seventy percent of India’s population or more – around 900 million people – languish under poverty with less than $2 per day. It is now more than evident that Demonetisation – the blunder that it was – cost India not only a fall in its growth rate, but, more importantly for the youth and workers, it cost precious jobs. A recent estimate puts that India lost 20 million jobs! India’s jobs crisis: 25 million applicants for 90,000 vacancies! One million Indians enter the workforce each month, but the number of jobs being created is a fraction of that number. More than 25 million people have applied for 90,000 vacancies in India’s state-owned railways – an imbalance that illustrates the country’s struggle to find jobs for its employable millions. The desperation for these jobs highlights a long-standing criticism of Prime Minister Narendra Modi’s four years in power: that his government has failed to create employment. When he was elected in 2014, Mr Modi promised an economic revival that would create many avenues for employment. Vowing to build up the manufacturing sector, for example, he said that his “Make in India” initiative would create 100 million jobs by 2022. In February of last year, India’s unemployment rate hovered around 6.1 per cent, the highest in 15 months, according to the Centre for Monitoring Indian Economy, a think tank based in Mumbai. About two-thirds of India’s population of 1.34 billion is under the age of 35, and around one million Indians enter the workforce each month. 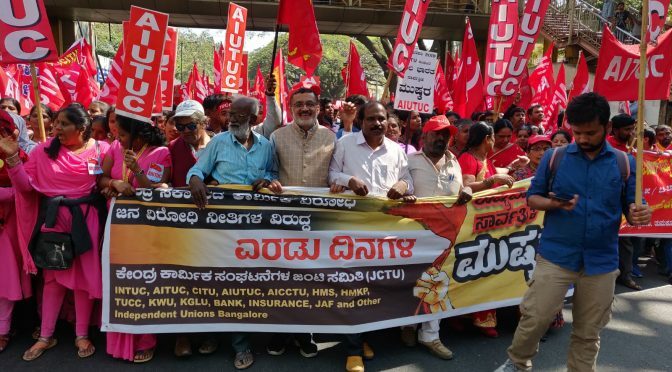 ‘Forum against Free Trade Agreement’, a pro-labour Network, wrote: “We believe that over two decades of neo-liberalism pursued through the agenda of trade openness, de-regulation and privatisation has failed the Indian masses. 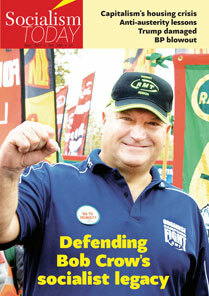 As the striking unions point out – today, there has been a deepening of the crisis of decent jobs. Free trade rules, whether of the multilateral World Trade Organisation (WTO) or the new-age regional free trade agreements (FTAs) and bilateral investment treaties (BITs), all have serious implications for workers and the economy”. Though the participation in the two days of strike was tremendous and unprecedented by all counts, the political impact of this working class action, supported by peasants, students and youth, was lost in the volume of calculations and permutations in relation to alternatives to the current hated regime of Modi and BJP. Already off the stage, back-room manoeuvres are being made to cobble-up a coalition or alliance of sorts to bring in the so-called “secular” Congress as the alternative to the communal Modi regime that even resorts to ‘fascistic’ methods. The brand tag of secularism is what the Communist/Stalinist left has historically used to peddle its disastrous strategy of searching for ‘progressive’ supporters among the capitalist representatives. But this time round, owing to their own ideological disagreements, there is a clear division emerging among the two dominant ‘Communist’ parties. This is particularly so in the CPI(M). One wing – the Yechuhry wing – takes shelter under the false premise of India under Modi being “Fascist”. Hence, it advocates a no-holds barred alliance with all and sundry. The other wing, under Karat, puts forward a slightly different concoction of a “secular-democratic” coalition barring?? Congress against the communal BJP. Yet, the left led by the CPI(M) and CPI have no clue as to how to take the fight forward. Just as an example, Modi in a desperate attempt to divert the attention of the media and scuttle the positive effect of the two days General Strike, without any warning announced a 10% job and education quota for the economically weaker sections among the ‘forward castes’. And even hurriedly got it passed in both the houses of the parliament, not just from the votes of the BJP but also getting votes from the opposition including the CPI(M). Most importantly, this move is to create confusion and disaffection among the struggling people who have begun to see through the divisive communal and casteist machinations of the BJP and Rashtriya Swayamsewak Sangh (RSS). But instead of calling this latest fraudulent move of Modi by its right name, and leading a mass revolt against the regime, the left are engaged in mere sophistry. Previous Post8th & 9th Jan. General Strike 2019!